How in the world is Thomas Davis going to play with a broken arm in 14 days? He already promised reporters that “I guarantee you I will not miss the Super Bowl.” Don’t doubt the man that has overcome three ACL surgeries. In fact, I would count on him overcoming the odds to play. NFL players prove their toughness week in and week out through the grueling season. Come playoffs, that determination to play through injury increases. When it’s time for the Super Bowl, that extra week seems to have “magical” healing powers. Players and medical staffs pull out every trick in the bag, accept some reasonable medical risk and do what they need to play. Was it the new platelet rich plasma (PRP) treatment or sheer will that allowed Hines Ward to play in Super Bowl XLIII only two weeks after a knee MCL sprain? Terrell Owens went against medical advice to play in Super Bowl XXXIX, six weeks after ankle surgery for two torn ligaments and an associated fracture. By video, Davis has an isolated ulna fracture, commonly referred to as a “nightstick fracture” from a direct blow. As TE Daniel Fells leaped, his knee “karate chopped” Davis’ forearm much like a martial arts demonstration where a black belt snaps a piece of wood. Such a mechanism of injury is unlikely to also break the accompanying radius bone. If both forearm bones were broken, there would be no way for Davis to play. Davis was placed in a short wrap/splint, indicating a relatively stable isolated break. An unstable forearm fracture requires long arm immobilization of the joint above (elbow) and below (wrist). This victory podium picture is evidence that Davis’ injury is not near the elbow joint. It is impossible to play in a long arm cast. Since one is not needed, he has a chance to play in Super Bowl 50. Expect surgery to be announced for Davis. Isolated ulna fractures tend to sometimes heal poorly in a cast. The plate and screws inserted will provide early stability and allow motion while the bone heals. A short cast/splint will provide protection against another direct blow. It has been reported that Davis would play if “it’s a pain tolerance issue”. Without surgery, the ulna is at risk to displace and he would need a long arm cast. Surgery stabilizes the bone, shortens the cast and essentially converts this injury into a pain issue. I have not seen Davis’ X-rays and there is no guarantee that the heart and soul of the Panthers defense plays. However, during my career as a NFL team physician, I have operated on two players with isolated forearm fractures that have returned to play in two weeks after surgery in a short cast. (Player names purposely withheld due to HIPAA privacy laws). Certainly what will happen to Davis is not the standard of care in the community; however, it is the standard of care in the NFL community. In his 11th season, this will be his first Super Bowl and he will have the “might not get back here again” mentality. A re-fracture might mean more surgery but would likely not end his career or create permanent disability. I have worked two Super Bowls, but my teams have never made it to play in one. Even so, I witnessed the power of an AFC Championship game where Philip Rivers played six days after knee surgery with an ACL tear. I can only imagine what happens during the two weeks before a Super Bowl. Jared Allen did not play with a broken foot, but he will not want to miss his only Super Bowl chance in his 12 seasons. The “healing powers of the two weeks before the big game” applies to him as well. If he has a base of the 5th metatarsal fracture, he will play. If Allen has a more traditional stress/Jones type fracture, it will become a coaching/effectiveness decision. Roman Harper did not return with a laceration and eye injury. Unless his vision is affected long term, he will play in two weeks. Even if he had an “eye socket” (zygomatic arch or orbital floor) fracture, I doubt that would keep him out. Same goes for the knee injuries of center Ryan Kalil and fullback Mike Tolbert. 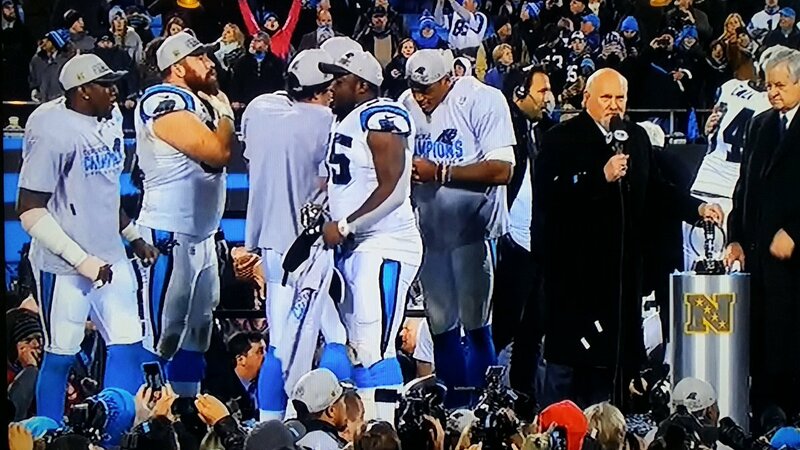 Kalil finished the game and Tolbert joked he was just tired when he exited. The Denver defensive backs are the biggest concern. Both starting safeties exited the game. Darian Stewart has a knee MCL sprain but will find a way to play. TJ Ward re-injured his ankle but it appears mild. CB Chris Harris, Jr. was limited but played better than expected. He left arm was strong enough to hang on to Julian Edelman for a key fourth down stop. Peyton Manning’s plantar fasciitis is not gone but worry about it should be over. He had the Broncos longest rush of 12 yards for most of the game. Arm strength is still the main health issue and that will unfortunately never change. New England had a great season considering that they lead the league in injuries by at least one metric. Injuries eventually catch up to all teams, including those coached by Bill Belichick. Injured defenders Jamie Collins, Chandler Jones and Dont’a Hightower all played but Jerod Mayo was placed on IR. Rob Gronkowski returned after a big hit to his left thigh and battling through cramps. Julian Edelman was seen limping in the locker room and I hope that doesn’t mean a second surgery like the one needed for Dez Bryant. No excuses, injuries are a part of the game. The Patriots did well to come this close to another Super Bowl. Health does not guarantee success, as Arizona was mostly healthy. Carson Palmer’s finger was not an issue according to Jay Glazer before the game and Bruce Arians after the game. Arizona was considered injury-free other than those they have lost already to injured reserve. If they could have won, they would have gotten RB Chris Johnson back from short-term injured reserve. A Super Bowl return would have been the latest ever for a player to come off IR/dfr. MMMD 5: Tony Romo surgery? The Cowboys quarterback is set to have a CT scan this week in anticipation of potential surgery. A prophylactic procedure is contemplated to help prevent future collarbone breaks. Romo has had a total of three fractures to the same clavicle, two this season. Short term, a plate could make a clavicle stronger. Long term, it could weaken the bone and act as a stress riser. At 36 years old, Romo and the team seem more worried about the immediate future. A custom plate will likely be needed as the standard shapes will not fit well given the previous fracture deformity. The plate could be removed in the future but not before this season. Surgery was a consideration after the initial break. It would have provided early protection against re-fracture. I have not seen the X-rays and am not second-guessing the Cowboys decisions. It is possible the configuration of the original fracture and/or patient choice lead to a decision for initial non-surgical treatment. Either way, Romo will be healed for 2016. The question is how many more years before the Cowboys need a new starting QB? MMMD 6: Draft season revving up. Draft talk has already started. This is the NFL’s second season. There will be 107 players entering the draft with college eligibility remaining. 11 have graduated but could still play another year. 96 underclassmen have declared for the draft. Last year there were 74 underclassmen. The trend of an early exit from college continues. Indianapolis will continue host the Combines through 2020 with a newly signed contract. Any move to Los Angeles for Stan Kroenke’s new kingdom will have to wait. As the season has one game remaining, I will continue to add to the current totals. I welcome any comments/criticism about how I self-grade. Jamie Collins and Chandler Jones did indeed play, while Jerod Mayo did not. Even though Mayo’s placement on IR may have involved personnel decisions, it still counts as an error on my tally sheet. Julian Edelman’s post-game X-ray was indeed precautionary. Thomas Davis confirmed his forearm fracture. Gronk was not injured when he pulled himself from the game but instead had cramps and muscle issues. Darian Stewart was listed as questionable, but as anticipated, did not return to the game. The 154-9 (94.5%) record last week now becomes 160-10 (94.1%). Thanks for following along.